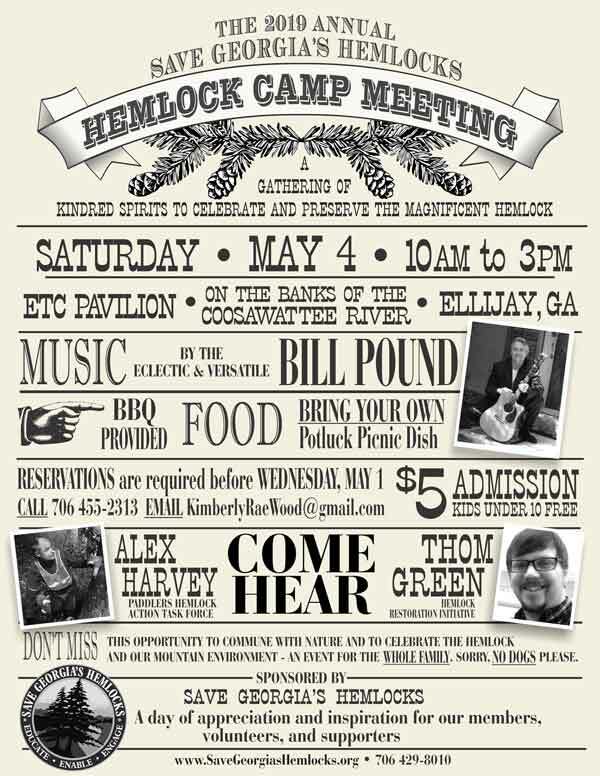 Please come to Hemlock Camp Meeting 2019! saplings for adoption, raffle, recognitions & awards , and a map. North Georgia’s hemlocks are in danger of almost total extinction due to a rapidly spreading infestation of the hemlock woolly adelgid (HWA), an invasive insect from Asia with no local natural predator. Hemlock stands are of vital importance to wildlife, water and air quality, local economy, and basic quality of life, and their loss would create problems of enormous scope and dire consequences. We have only 7 hemlock cone pendants still available. This beautiful solid sterling silver pendant is cast from a real eastern hemlock cone. 100% of your purchase will be used to support our efforts to save endangered hemlocks. $45.00 -- Quantities are limited. Call 706-429-8010 or email Donna (at) SaveGeorgiasHemlocks (dot) org. Evergreens are a symbol of everlasting love. Show yours with a gift that will be treasured for years to come. Property owners have the option to save as many of their own hemlocks as they desire, but focused efforts to raise awareness, promote action, and provide assistance have been extremely limited in most north Georgia counties. SAVE GEORGIA'S HEMLOCKS, a 501(c)(3) nonprofit organization, has implemented the Hemlock Help Program -- a statewide initiative of educational and charitable service -- to address this urgent need on both public and private land, wherever hemlocks are threatened in Georgia. HWA infestation has been confirmed in all 19 counties within the native hemlock range in Georgia and reported in several more counties in the Atlanta area. These magnificent trees need your help NOW! Aesthetically, these beautiful trees contribute greatly to the enjoyment of those who live, work, and play among them, as well as the many people who come to north Georgia for tourism and recreation. 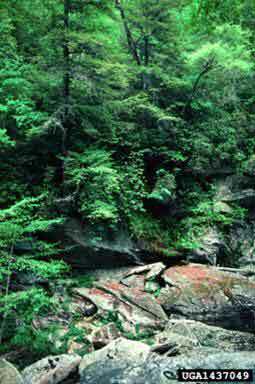 What would your special places in the mountains look like without hemlocks? 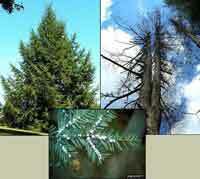 Environmentally, hemlocks are a keystone species and play a unique role in providing food and habitat for about 120 species of vertebrates and more than 90 species of birds, shade for native plants, cool temperatures for trout streams, and protection for watersheds and water quality. How many environmental "dominoes" might fall if the hemlocks fall? Economically, healthy mature trees such as hemlocks can add as much as 7-10% to property values, provide the net cooling effect of 10 room-sized air conditioners running 20 hours a day, perform millions of dollars worth of water purification per mature tree along our waterways, and save billions of dollars a year by filtering CO2 and other pollutants from the air as they produce oxygen for us to breathe. Can we afford to lose these valuable trees? Hundreds of thousands of Georgia's hemlocks have already died due to the woolly adelgid, and millions more are infested. Because of our mild climate, the hemlock's decline here in the South is progressing more rapidly than many scientists originally predicted, with infested trees dying in as few as 3 to 6 years. The next two years may be the "tipping point" in which aggressive action can still make a difference. Please join us. Your participation and support are much needed and very welcome! Check out the Schedule of Events to see a variety of opportunities to participate in educational events and volunteer service projects. We also need and very much appreciate your financial support. Visit How You Can Help to learn how you can make a donation, become a member, or find your own special way to help. Here are some recommended readings for knowledge and inspiration. Enjoy!